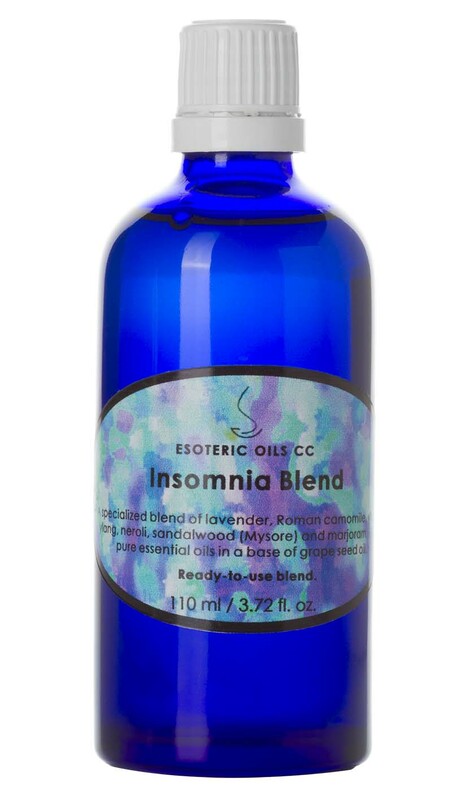 Insomnia Blend - our specialized essential oil blend to help you sleep. Not being able to fall asleep is bad enough, but not having enough sleep the night before also impacts on our productivity. Tossing and turning the night away, without being able to fall asleep, is far from the best experience to prepare you for fighting your battles the next day, yet millions of people suffer from insomnia. A quick-fix remedy would be to pop a couple of sleeping tablets, yet these habit forming drugs may cause more problems than simply curing your sleeplessness. The cause of insomnia must also be found and dealt with - be that pain, fatigue, worry, excess stress, diet - either eating too much or too little, using too many stimulants like coffee, etc. A warm relaxing bath before bedtime can also help to induce sleeping, and here essential oils can be used very effectively to help combat insomnia. With more and more people understanding the need to move away from synthetic drug compounds, and to look for alternative natural remedies, we have had numerous requests from clients, and retail companies, to blend and supply a mix specifically targeting insomnia. The blend that we achieved is based on the feedback received from clients, and has proven to be popular. To have a more in-depth look at the oils that we used in this blend, please click the hyperlinks below. Our Insomnia Blend can be applied by gently massaging small amounts onto all easy-to-reach areas of the body about half an hour before retiring for the day. Special attention can also be given to the neck and shoulder areas, and some people also massage a small amount onto their temples. An alternative way to use this blend, is to apply small amounts to the entire body while your bath water is running in, and then soaking in the warm bath after you have applied the oil.